Twenty days before Election Day, students and residents from the Greater Boston gathered at various debate viewing parties, laughing, cheering and booing as Democratic presidential candidate Hillary Clinton and Republican presidential candidate Donald Trump faced each other on live national television for the third and final time. While Clinton struggled to defend the Clinton Foundation, Trump’s performance was nowhere near perfect, analysts said, especially after he refused to say whether he will accept the results of the election. So who was the winner of the debate? Did the final debate change voters’ minds? And what is the takeaway from this unique presidential election? 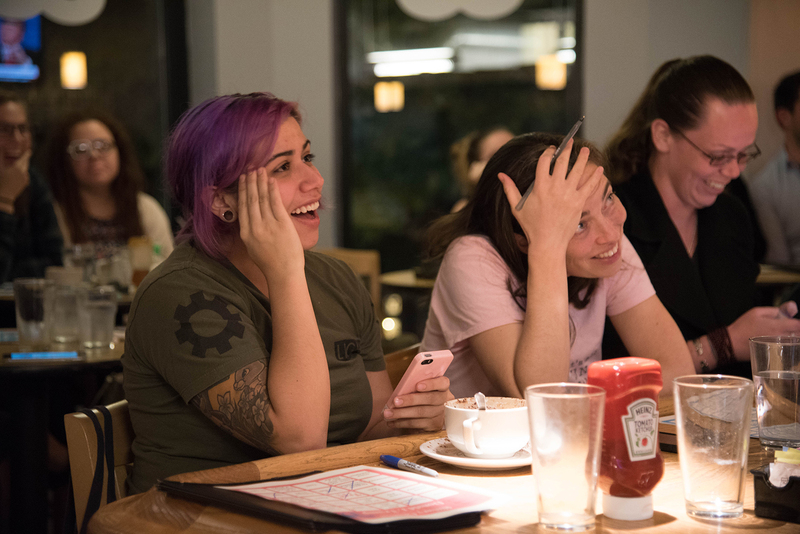 Reporters from The Daily Free Press interviewed students and residents from four debate viewing parties on campus and in the city — Trident Booksellers and Cafe, WBUR, 10 Buick St. and BU Central — to see what they had to say. For Dino Christenson and Douglas Kriner, debate viewing parties are a long-time tradition. Ever since President Barack Obama’s first election, the two Boston University political sciences professors have hosted viewing parties for almost every political event, including the first two debates in this election cycle, Kriner said. On Wednesday night, approximately 20 students attended the viewing party for the third and final debate at 10 Buick St., exceeding the two professor’s expectation. Kriner said the best part about having these debate viewing parties is the conversation that comes as a result. During the debate, the lively crowd laughed from time to time at the exchange between Donald Trump and Hillary Clinton, especially when Trump called Clinton a puppet and a nasty woman. 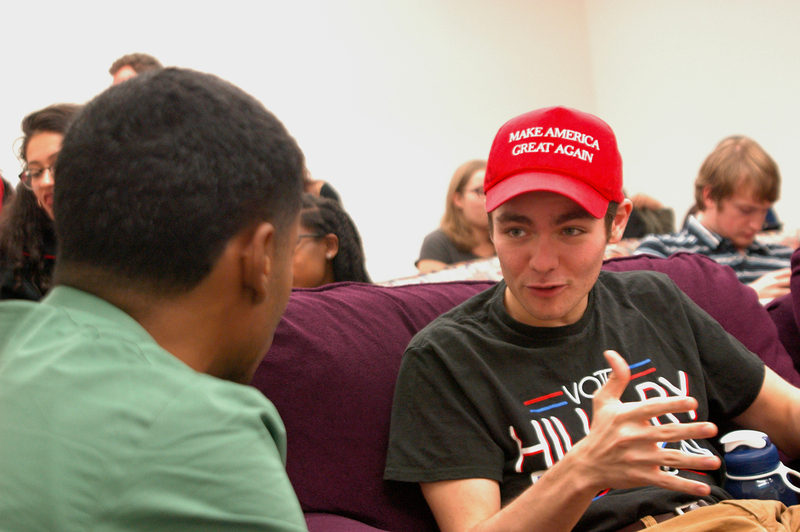 Nicholas Fuentes, a freshman in the College of Arts and Sciences, said Trump was the winner because his strengths rang through in this debate. Ashley Stern, a senior in the Sargent College of Health and Rehabilitation Sciences, said it’s clear Clinton should be the next president. Pietro Scribani Rossi, a CAS junior, said that as an international student, he enjoys the entertainment element of the debates. Blue and red bingo cards sat on top of dining tables at Trident Booksellers and Cafe, with boxes reading “Locker-room talk,” “NATO,” “Crooked Hillary” and similar common phrases from this presidential campaign. More than 60 people attentively watched the final presidential debate, only looking away from the television to check their social media feeds. One attendee, Erin Carey, 37, of Dorchester, said she went to Trident to experience watching the tumultuous debate with others in person, rather than reading posts from Facebook friends online. Mackenzie Van Engelenhoven, a Trident event organizer, said the debate was one example of how Trident serves as a venue for open discussion within the Boston community. Laughter rang through the second floor dining area following Republican nominee Donald Trump’s “bad hombres” comment, and loud clapping followed Democratic nominee Hillary Clinton’s review of her political experience. Many Trident guests were not ashamed to vocalize their feelings for the candidates throughout the debate. Despite the open atmosphere of the viewing party, Claire Cerda, 24, of Brookline, said she felt she had to react more cautiously while watching the debate in Trident compared to how she would react in the comfort of her home. “It’s hard to sit in a public space and be mindful of other people’s thoughts and opinions, especially having to do with politics because it’s so personal,” she said. However, Ethan Machemer, 31, of Dorchester, said watching the debate at Trident was a way to become more informed on common concerns among voters. It was informative for him to listen to the comments and reactions of the crowd when the candidates said something especially interesting, he said. 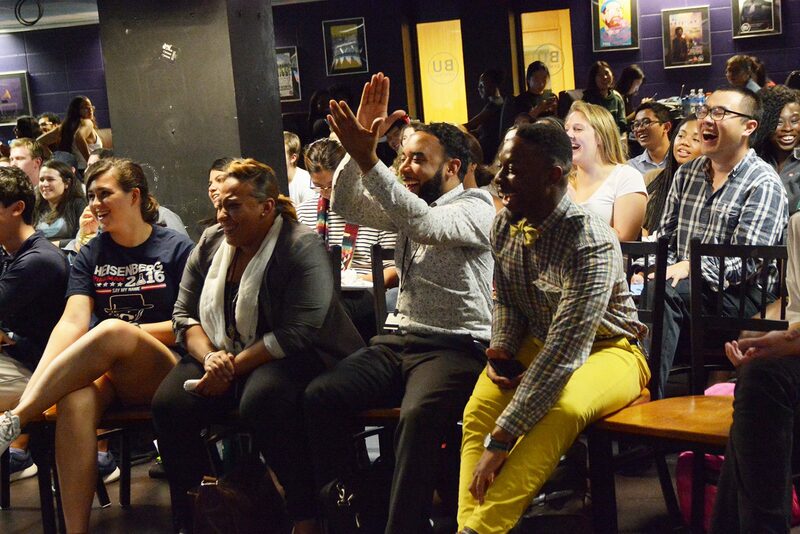 Patriotic bunting, selfie props and life-size cardboard cutouts of the presidential hopefuls filled Boston University Central Wednesday evening, as the Howard Thurman Center for Common Ground, along with the BU chapters of Brothers United and Omega Psi Phi, hosted a viewing party for the final presidential debate. Wezi-Anne McCarthy, an organizer of the party and a junior in the College of Arts and Sciences, said the purpose of the event was to raise students’ awareness and involvement in the election. Approximately 100 students entered BU Central before the debate started. They quickly filled the room and started talking about what they expected from the debate. Lexi Davis, a freshman in the College of General Studies, said before the debate that she attended because she likes viewing these debates around friends and other students interested in politics. “It’s important to be surrounded by other people who are watching [and] hear other opinions,” Davis said. Once the debate started, students watched quietly, at least for the most part — some broke the silence when Donald Trump suggested Hillary Clinton return the Clinton Foundation’s money that came from anti-LGBT countries. Several students in the room murmured, agreeing with Trump’s comment. Javier Martin-Fernandez, a second year graduate student in the School of Education, said this debate probably won’t change voters’ decisions. The radio station WBUR held a presidential debate viewing party Wednesday night, with discussions held before and after with WBUR political journalists Anthony Brooks and Ken Rudin. 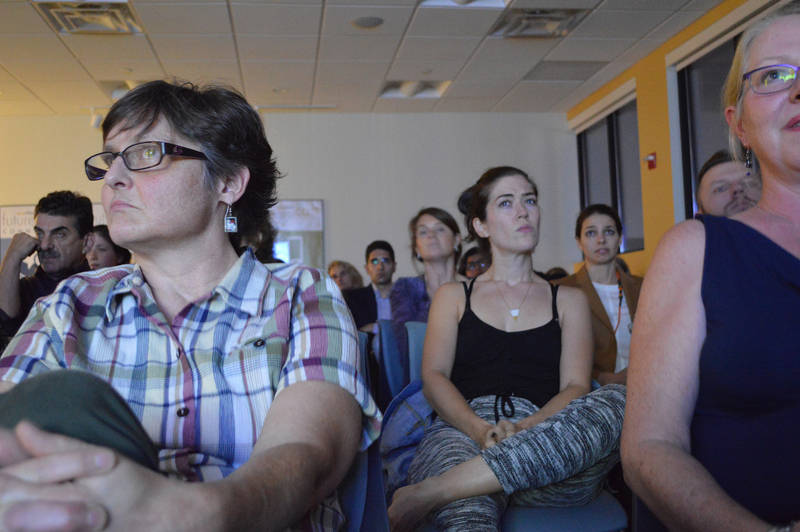 A crowd of 60 viewers sat and stood in a room in WBUR’s main headquarters, and many seemed to be in support of Democratic nominee Hillary Clinton. Amy MacDonald, the viewing’s organizer, said although not all attendees were necessarily Clinton supporters, they were evidently against Republican nominee Donald Trump. One of the viewers in attendance, Jeremy Morrison, 33, of Somerville, said he applauds Clinton’s performance during the debate, despite its imperfections. MacDonald, in response to the crowd gathered at WBUR, said the turnout was better than initially expected. Alice Gray, 69, of Brookline, said she came to the viewing because of her liking for political updates. Throughout the debate, attendees reacted varyingly toward candidates’ responses. Attendees did not show much reaction toward Clinton’s responses. Meanwhile, many attendees jeered and laughed at Trump’s remarks. Megan McHugh, 32, of Somerville, said Clinton’s skill in debating outmatched Trump’s remarks. McHugh said she appreciated Clinton’s ability to formulate coherent responses, compared to her opponent. “I feel tremendous gratitude towards Hillary Clinton particularly for dealing with Donald Trump’s dizzying incoherence with such composure and such focus and such substance,” she said. Nicole Morris, 40, of Brookline, said she watched the debate for amusement, and that it should be sufficient for undecided voters to decide their pick.